St John the Divine, Richmond, Surrey, by Lewis Vulliamy. Drawing by Thomas Allom. Engraving. Publishers: Rook & Co. London, 21 January 1862. Source of image: Local Studies Library collection, Richmond). Scan and text by Ingrid Brown. Formatting by Jacqueline Banerjee. You may use this image without prior permission for any scholarly or educational purpose as long as you (1) credit the person who scanned the image, and (2) link your document to this URL or cite the Victorian Web in a print document. Cloake, J. 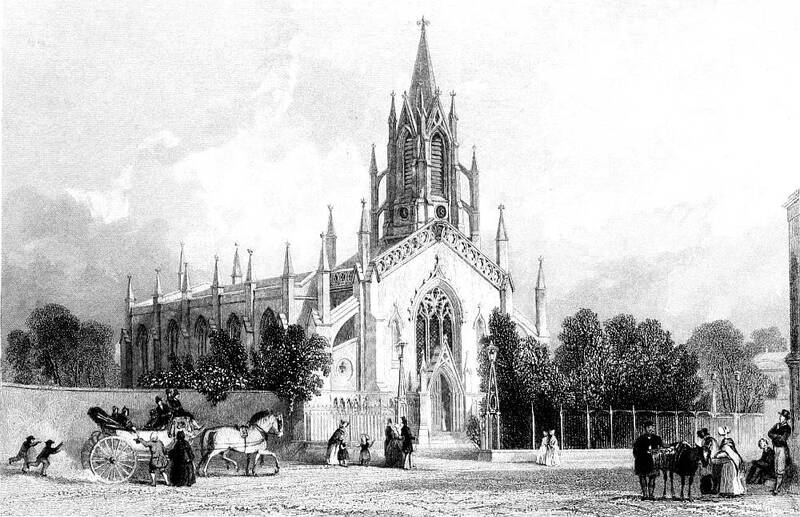 "Richmond Parish Church: Richmond Retrospect." Richmond and Twickenham Times. 7 August 1987. _____. Richmond Past. A Visual History of Richmond, Kew, Petersham and Ham. Historical Productions Ltd, 1991. Velluet, P. RIBA, IHBC. St Matthias’ Church, Richmond. A Guide and History. The Friends of St. Matthias, 2008.